Read all safety precautions and installation instructions carefully before installing and keep them for future reference. [UL Certified Weatherproof Products] UL certificated power cord for safer and durable use. IP65 waterproof to protect the strand from rainy, windy, or damp climates in summer or witner. [Widely Application]Waterproof and high quality strand made it widely applicated. It's a good choice for weddings, restaurants banquets and celebrations. 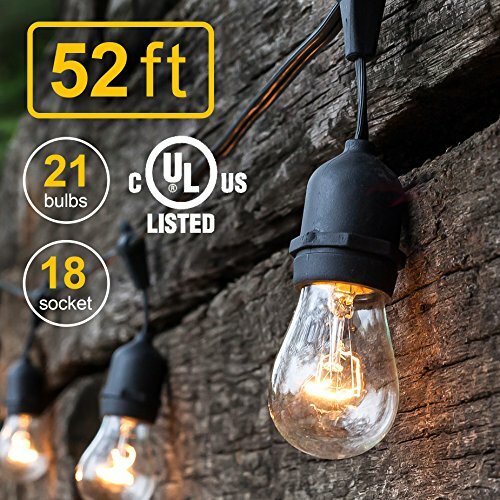 [Connectable 18 Hanging Sockets] 21 incandescent warm light bulbs with 52 feet heavy-duty flexible rubber strand.More lamps and longer lines to give you a wider range of lighting. [5-YEAR WARRANTY] Your satisfaction is our priority - an unlimited warranty means we've got you covered. Easy and fast replacement is offered if any quality issue exists.